Diamond Head. It is one of the most famous craters in the world, simply because it is located in Hawaii. Its incredible beauty has a lot to do with that, too, however. Diamond Head is now a state park and includes many hiking, biking, climbing and walking trails. You can hike to the top of mountain, which was once an active volcano and look at the incredible view of the island. You will also be able to look out over the other islands, as well. Diamond Head was so named because from an aerial view it appears to have a pointed shape, like a diamond. The natives of the island originally referred to it as a crater that looked like a tuna fish because of its distinctive comparison to the dorsal fin of the same creature. Pearl Harbor. There is a small fee to be paid to visit the grounds where the Japanese attacked and killed American soldiers on December 7th, 1941. It is completely worth the price of admission. There are walking tours, the military base can be viewed and it is a great way to show kids a piece of infamous American history. 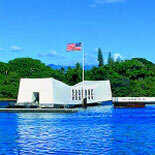 The Pearl Harbor walking tour equips you with a guide that will let you know some interesting facts about the attack. U.S.S. Arizona Memorial. You can acquire a tour for free here if you have already paid the fee to see Pearl Harbor. The tour is very serious and solemn. You are literally visiting a graveyard. The memorial itself is strikingly beautiful and it is a great reminder of the people who died in 1941. Kids will enjoy the ferry boat ride to the memorial and looking at the ship that is sunk underneath the waves. All in all, it is a must-see experience if you are in the Pearl Harbor area. Hanauma Bay Nature Preserve. Looking for a free experience that really gives you a taste of Hawaii? Hanauma Bay is gorgeous. There is a stunning coral reef that gives you and the family a chance to scuba-dive and snorkel into the clear, warm and blue waters. It’s also a nice place to just swim and play around in the sand. Let your kids play in the water while you relax in the sunshine, perhaps under the shade of a palm tree! Manoa Falls. Kids love to move! Take advantage of that and hike the one-hour trail to the breathtaking Manoa Falls. Planning your next vacation to Honolulu? Visit https://www.trustedtours.com/store/honolulu.aspx for tour and attraction discount tickets.